That ain't just any car. That's a 1966 Mercury Comet Cyclone GT. 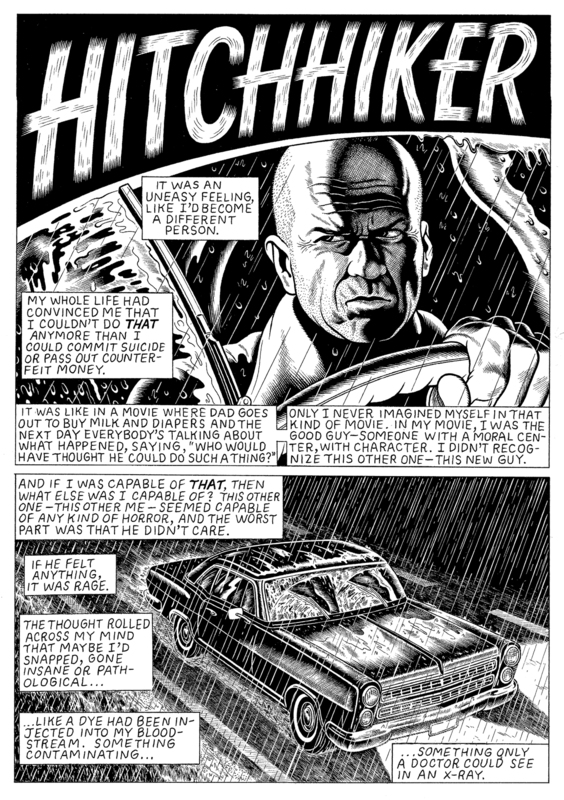 HITCHHIKER continues my ongoing obsession with mixing elements of film noir, pre-code Suspense comics, with an attempt at serious storytelling. Beyond the fact that I'm an undying fan of both film noir and pre-code Suspense comics, I think both are solidly linked to the Great Myth I'm chasing by the tail. Film noir especially works for me as a graphic style in the context of the Great Myth because it's such a powerful and unique American film genre. The pre-comics code comics (for me anyway) represent an era I've come to think of as the Golden Age of the American Myth. The graphic style of Al Feldstein, Wally Wood, Johnny Craig, etc, immediately recalls that era - and, by so doing, a part of the Myth. A big part. The decision to work with those styles in mind wasn't - or isn't - as self-conscious as it might sound. The style in which I work as a cartoonist stemmed from those influences (along with, more specifically than any of those others, Will Eisner's THE SPIRIT, especially his work from the late 1940's) long before I ever started contemplating this whole American Mythological Drama thing. It was more intuitive than anything else (I've got this theory that creatives are drawn to their influences because they see in those influences a hint of themselves; the process of developing a "personal style" is, in part, one of absorbtion and practice. In other words, if I'm influenced by Goya, for example, it's because I see a hint of my own worldview in the heart, or at the core, of Goya's. Half-baked? Maybe). I don't think it's a coincidence. But I don't know anymore what I don't think is a coincidence. I've completely forgotten what I was talking about. What I DO know is that you'll know your REAL job, when it comes along, because it'll be the one for which you'll receive no pay.